Snapped from Facebook before the thread was deleted. Names other than mine cropped out. 1. Viral graphic on Pintrest shared by one of your friends. Any truth found in this infographic is purely coincidental. 2. Semi-legit looking article apparently from MSNBC, titled “Want a Better Job? 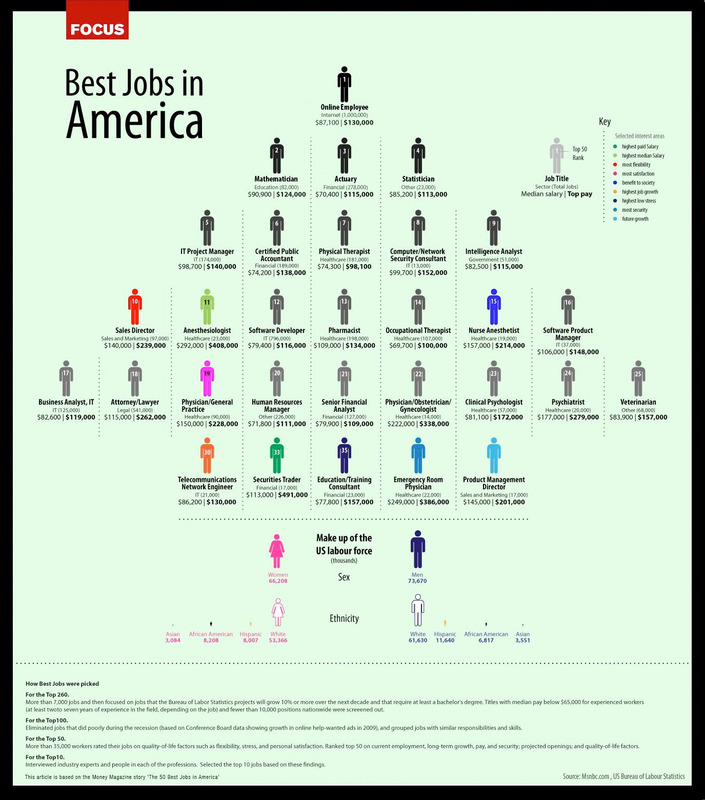 Top Jobs In America Revealed.” It praises working online for companies like “Home Cash Success” as the #1 type of job in America, citing an annual review by Career Cast. Links to the Home Cash Success website which looks exceedingly shady. 3. Googling the phrase Home Cash Success, second result: snopes.com: Home Cash Success Scam. Snopes article is from 2009 but seems to be describing the same thing. 4. 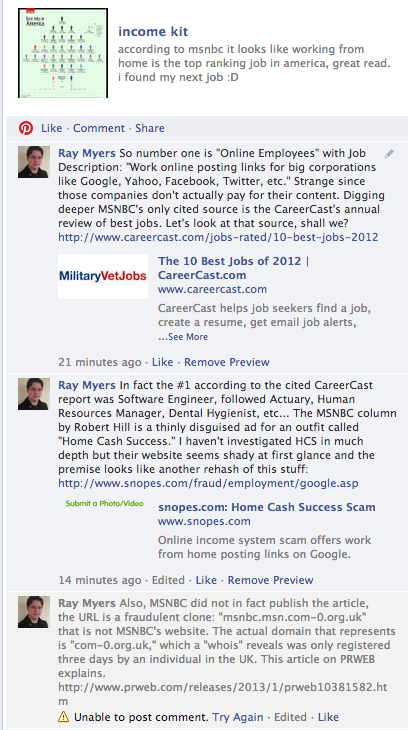 The actual 2012 review done by Career Cast, The 10 Best Jobs of 2012. Seems like a nice review and well researched. Says something completely different than the MSNBC article that cites it. 5. Upon attempting to write a letter to the editor informing NBCNews that one of their columnists screwed up and requesting a retraction, realize that the article is nowhere to be found from within nbcnews.com. 6. 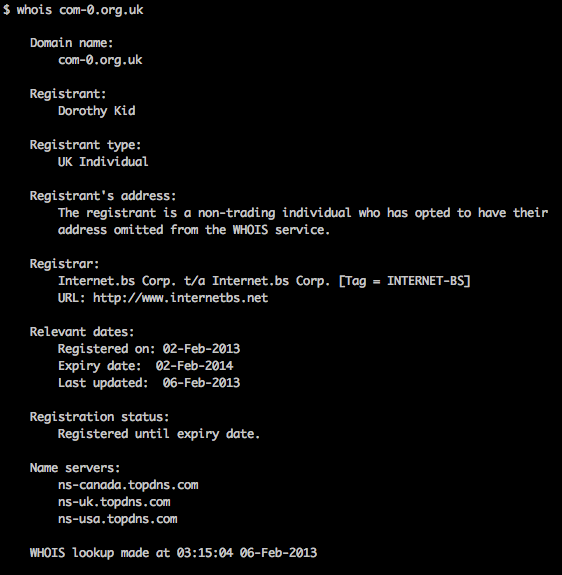 Re-inspect the first article link’s domain, “www.msnbc.msn.com-0.org.uk” … WAIT A MINUTE. Should’ve caught that a lot sooner, honestly. I’m sure Mike Finney would’ve. The specific facts here aren’t important. It’s the ritual. Skepticism is about more than the Shroud of Turin and Big Foot. It’s even about more than being a smartass on social media. Critical thinking is a lifestyle. We live in a world filled with information, good and bad, whizzing past us as fast as we care to absorb it. If you’re going to put some of it in your head, vet it.